Peridot Crystals: 100% natural untreated peridot crystal specimens! 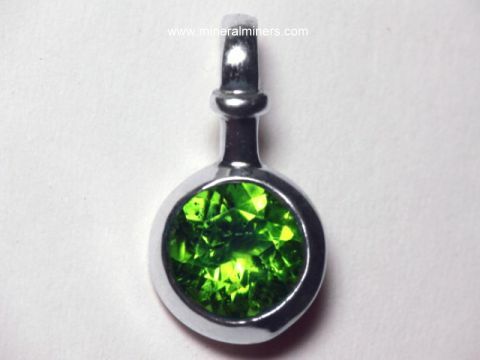 Try our Peridot Crystals Satisfaction Guarantee - compare our prices and our superior quality. Click on any peridot crystal image below to enlarge it. 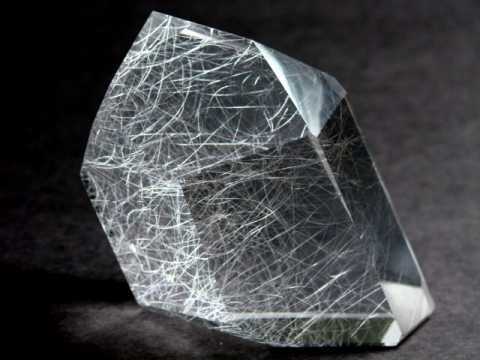 This small peridot crystal is naturally terminated and has a small amount of graphite and clay minerals on some surfaces, and it is transparent in the upper half. See an opposite side view of this natural peridot crystal specimen. This specimen is actually two intergrown peridot crystals. See also a view of this unique peridot mineral specimen laying on its side. This small peridot specimen is a partially terminated crystal. It is transparent and would yield 7 carats of lightly included gems. This peridot rough specimen is a crystal section with mostly broken surfaces. 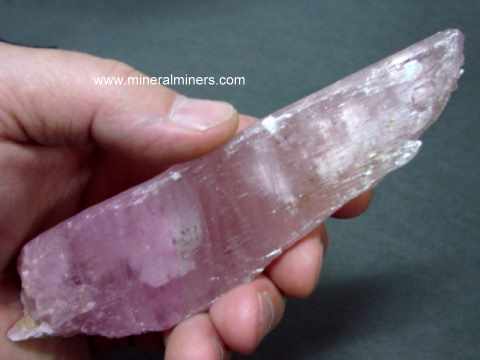 It is semi-transparent to transparent with some areas inside that would yield lightly included cabochon gems. See also an opposite side view of this peridot rough specimen. This small peridot crystal is naturally terminated. 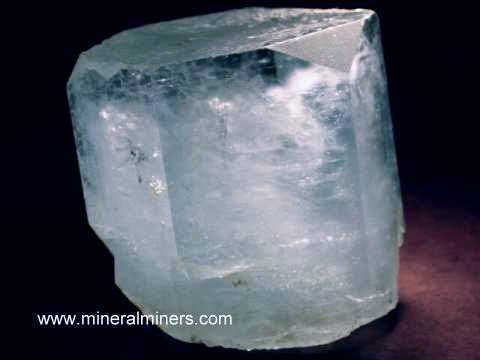 It has a transparent area inside that would yield a 10 carat lightly included gem. See another view of this natural peridot crystal. This small peridot crystal is naturally terminated. It is transparent and would yield a 12 carat lightly included cabochon gem. 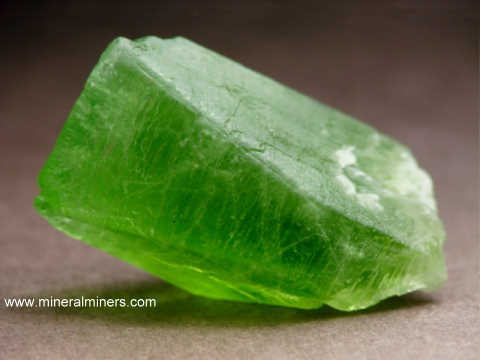 See a side view of this natural peridot crystal. This peridot rough specimen is a crystal section with mostly broken surfaces. 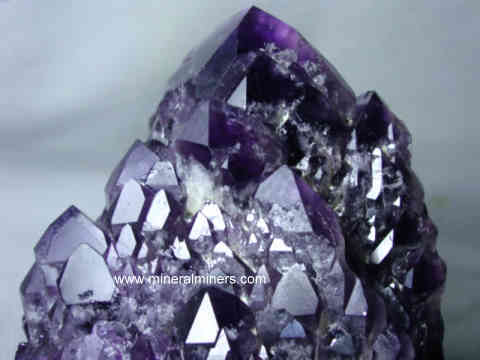 It is semi-transparent to transparent with some areas inside that would yield lightly included cabochon gems. This peridot rough specimen is a crystal section with mostly broken surfaces and a blocky shape. It is transparent and would yield a lightly included hi-dome cabochon gem weighing over 15 carats! 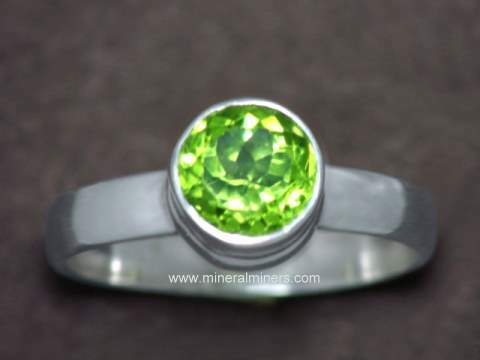 See also an opposite side view of this gem grade peridot specimen. This peridot rough specimen is a crystal section with mostly broken surfaces. It is transparent and would yield a 15 carat lightly included cabochon gem. See also a back-lit view of this gem grade peridot specimen. This small peridot crystal is naturally terminated. It has very consistent lightly included transparency throughout, and it would yield a single 20 carat lightly included cabochon gem. See an opposite side view of this natural peridot crystal. 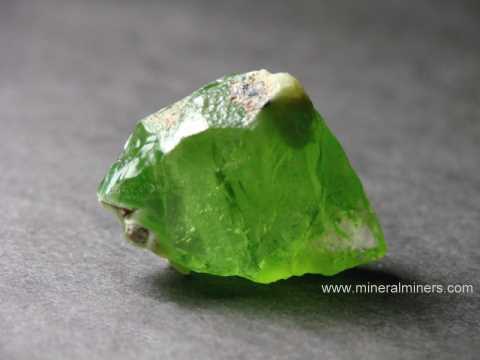 This peridot rough specimen is a crystal section with mostly broken surfaces, and it has a relatively thin flat shape ideal for making a large cabochon gem. 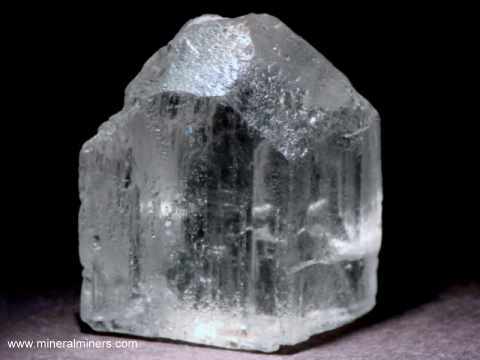 It is transparent and would yield a lightly included cabochon weighing 20 carats. See also a side view of this gem peridot rough specimen. See an additional view of this natural peridot specimen. This natural peridot specimen is a partially terminated peridot crystal with some broken areas. 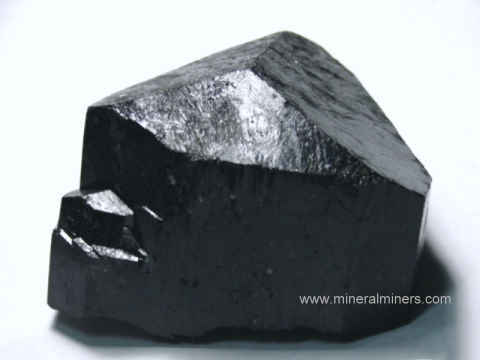 There are white clay minerals on some surfaces and some graphite on the opposite side. 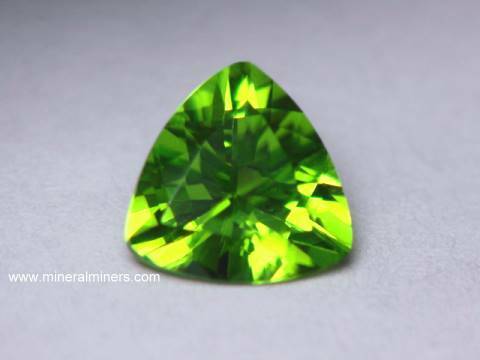 This peridot is opaque to translucent at its base and becomes transparent towards its tip with a large area inside showing good cabochon grade transparency. 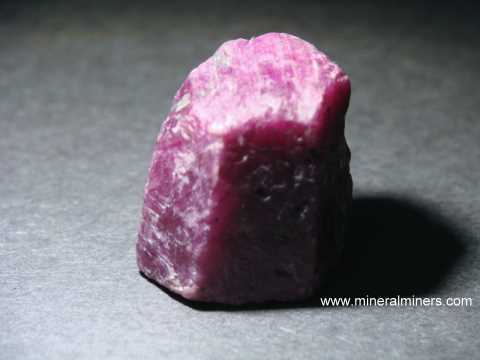 It would yield a 20 carat lightly included cabochon gem. See also an opposite side view of this unique peridot mineral specimen. This naturally terminated peridot specimen is actually two intergrown crystals with gem grade transparency. See a back-lit view of these natural color peridot crystals. 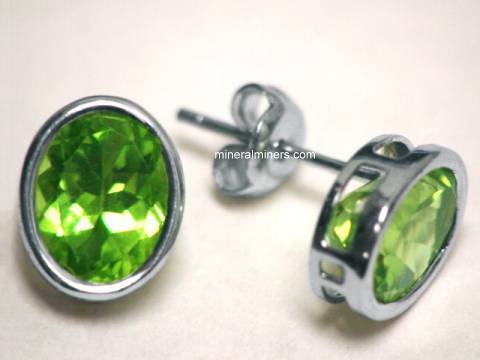 See also a side view of these gem grade peridot crystals. Peridot Specimen Dimensions: 1.7" x 1.3" x 0.7"
This large size peridot crystal is translucent to semi-transparent with a transparent gem grade area at its tip. The photo at left of this natural peridot crystal was taken under incandescent light. See a back-view of this fine peridot mineral specimen. See also a side-view photo of this natural peridot crystal. 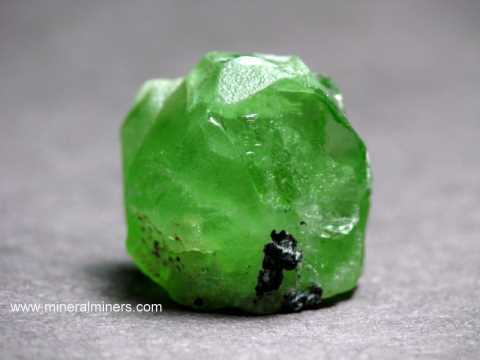 1.4" x 1.3" x 0.8"
This natural peridot crystal makes a nice mineral specimen just as it is, although it had large transparent areas of fine cabochon grade transparency, and it could be ground and polished into beautiful gemstones. The surfaces are slightly dull and the terminations are in very good condition overall. The photo at left was taken under incandescent light. This naturally terminated peridot crystal has a small amount of graphite and clay minerals on some surfaces, and it has some transparent gem-grade areas inside. See also an opposite side view of this natural peridot mineral specimen. See also a side view of this unique peridot crystal. This natural rough specimen is a peridot crystal section with some prismatic faces. 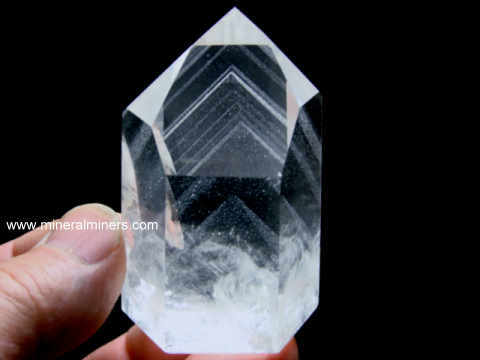 It has a small amount of clay minerals on some surfaces, and there is a large transparent gem-grade area inside that would yield a lightly included 14mm round faceted gem. 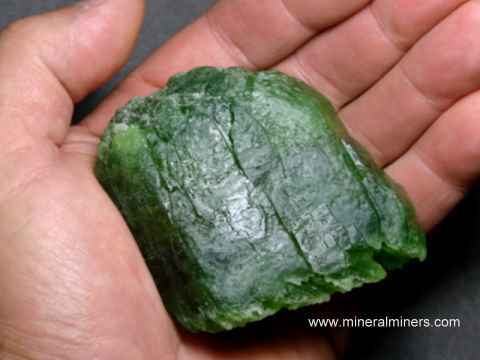 See a view of this natural peridot gem rough specimen held to a light. See also an opposite side view of this unique peridot gem rough specimen. 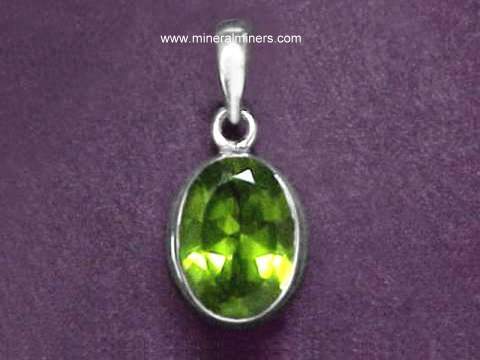 See also an opposite side view of this natural peridot gem rough specimen held to a light. Peridot Mineral Specimen Dimensions: 1.6" x 1.4" x 0.7"
This natural peridot mineral specimen is a partially terminated peridot crystal section with large gem-grade areas inside that would yield 40 carats of lightly included cabochon gems. 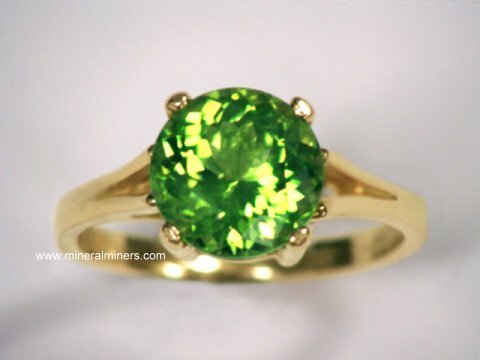 See a back-lit view of this rare quality peridot gem rough. See also a side view of this peridot gem rough specimen. Giant Peridot Crystal, 1333.5 carats! Peridot specimen measurements: 3.25" x 2.8" x 1.2"
This rare specimen of natural peridot is a very large naturally terminated peridot crystal with no matrix, and it weighs over 1/2 pound! 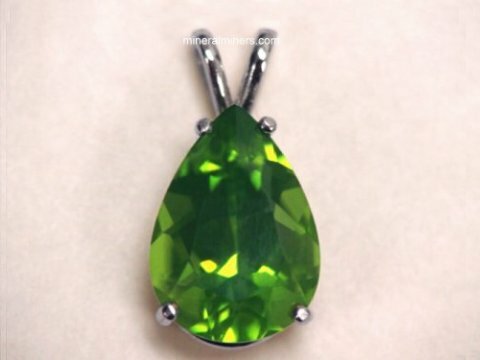 See a back-lit photo of this rare size peridot crystal taken under daylight. See also a photo showing this natural peridot crystal laying on its side. This entire peridot crystal is semi-transparent to transparent! See a back-lit photo of the opposite side of this giant peridot crystal. This rare size peridot crystal specimen could be sawn, ground and polished into several beautiful gemstones. It has some internal fractures separating large gem grade areas. See also a front lit view of this very rare size natural peridot crystal. Basalt Matrix Dimensions: 3.6" x 3.6" x 2.5"
Olive green peridot grains that crystallized deep within the earth's crust aggregated into peridotite. This peridotite was then breciated into small pieces and carried up to the surface by basaltic magma & gasses during a volcanic eruption. The peridot was later encased within the basaltic lava flow which hardened around it. Basalt Matrix Dimensions: 7.5" x 4.2" x 3.5"
Olive green peridot grains that crystallized deep within the earth's crust aggregated into peridotite. This peridotite was then breciated into small pieces and carried up to the surface by basaltic magma & gasses during a volcanic eruption. The peridot was later encased within the basaltic lava flow which hardened around it. This basalt matrix specimen has several large masses of peridot grains exposed around its surfaces. Basalt Matrix Dimensions: 8" x 6" x 5"
Olive green peridot grains that crystallized deep within the earth's crust aggregated into peridotite. This peridotite was then breciated into small pieces and carried up to the surface by basaltic magma & gasses during a volcanic eruption. The peridot was later encased within the basaltic lava flow which hardened around it. This basalt matrix specimen has a 2 inch mass of peridot grains exposed around its upper surface as shown. Peridot in Matrix Dimensions: 6.3" x 4.6" x 4.2"
Peridot grains that crystallized deep within the earth's crust aggregated into massive peridotite. The peridotite then broke up and was engulfed by basaltic magma and carried up to the surface by magma & expanding gasses during a volcanic eruption. See also an opposite side view of this natural decorator mineral specimen of San Carlos peridot in basalt matrix. 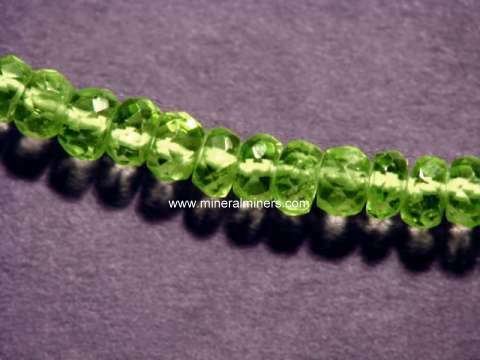 Some of the peridot grains are gem grade and measure up to about 1/8 inch across. Our Peridot Crystals are 100% Natural Peridot! 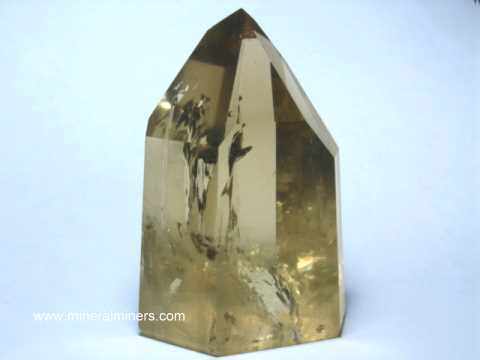 We also carry an assortment of stands for small & medium sized crystals & mineral specimens. 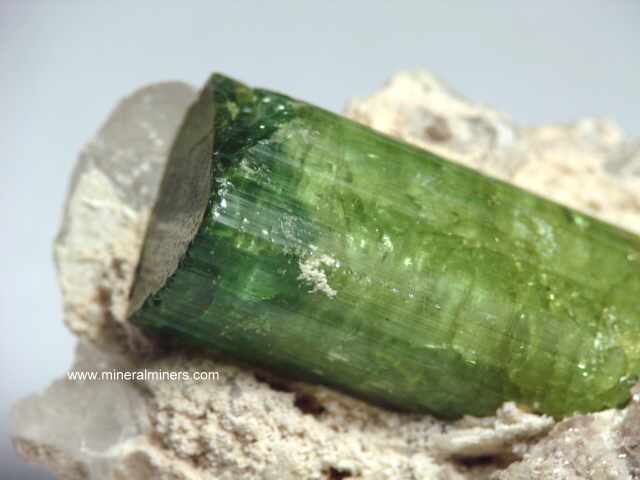 Each one of our peridot crystals is completely natural, and they were mined in Pakistan. 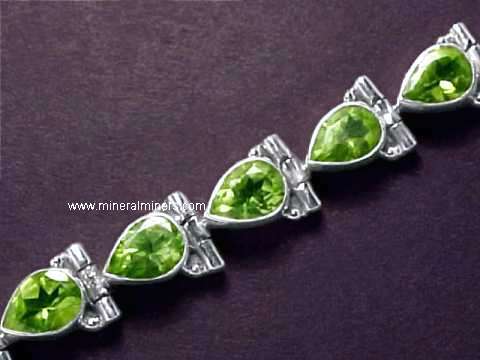 You may have noticed that some of our peridot crystals are light green and some have dark green color. This is because we do not treat or alter our peridot crystals in any way. 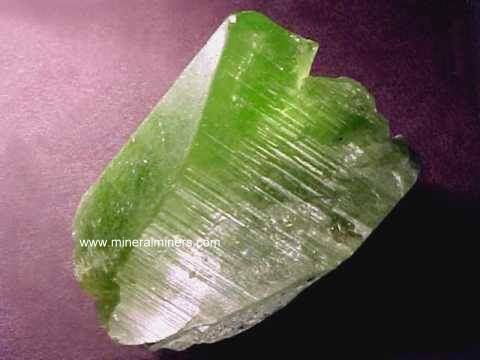 Here at mineralminers.com, we do not have any heated or treated peridot crystals, each crystal is 100% natural! 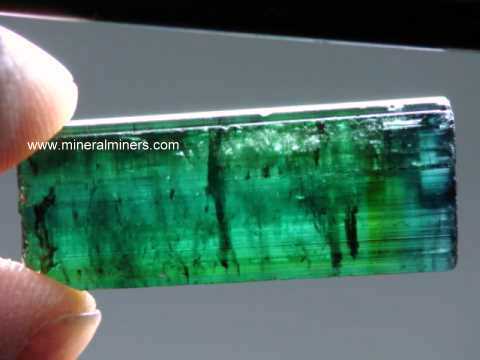 We specialize in rare quality natural peridot crystals with gem grade transparency, and we do have more peridot crystals in stock, including some very rare quality peridot crystals and some very large peridot mineral specimens. We also have small peridot mineral specimens available, and we are currently offering these inexpensive peridot specimens with special volume discounts as well! We do have more Natural Peridot Crystals crystals available. If you are interested in purchasing peridot crystals in large volume with the best possible volume pricing, then see our page for bulk volume crystal sales. 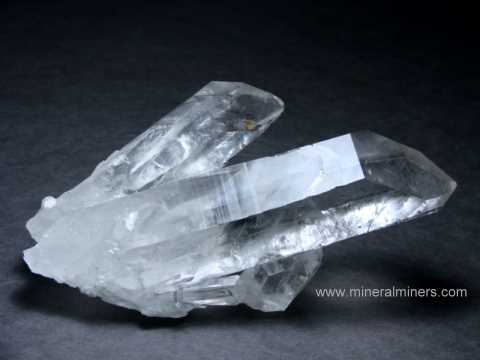 We have been mining for aquamarine, citrine, kunzite, topaz, tourmaline and other gems in Brazil for more than 25 years, and we have a very large variety of naturally terminated crystals available in many different minerals including fine pegmatite crystal specimens. 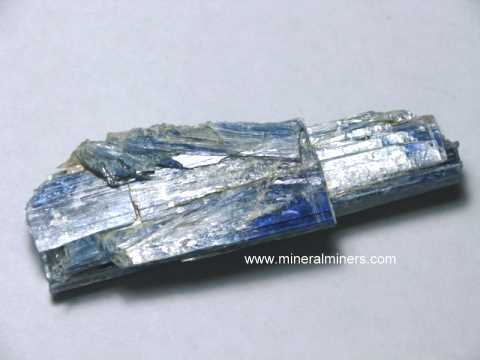 See the links below for a selection of superior quality natural crystals. 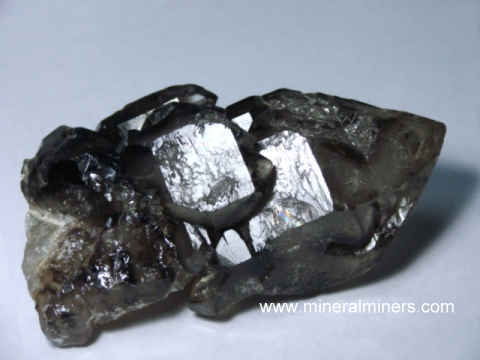 See also our pages displaying natural black tourmaline crystals. 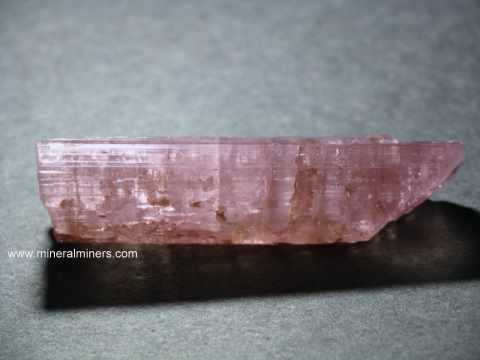 We also have pages displaying natural pink sapphire crystals & blue sapphire crystals. We have a large assortment of genuine peridot jewelry designs in stock including necklaces, earrings, bracelets and peridot rings. 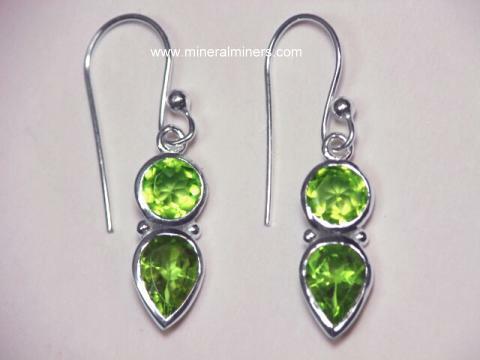 Our genuine peridot jewelry items are available in pure sterling silver and also in solid 14k gold. 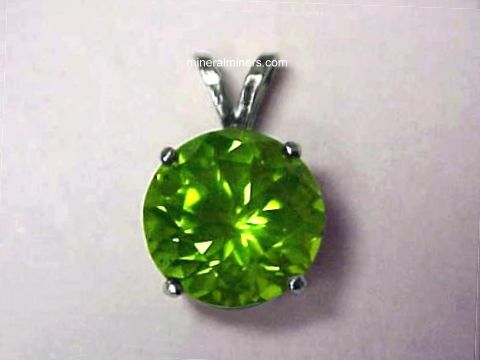 We specialize in Collector Quality Peridots! 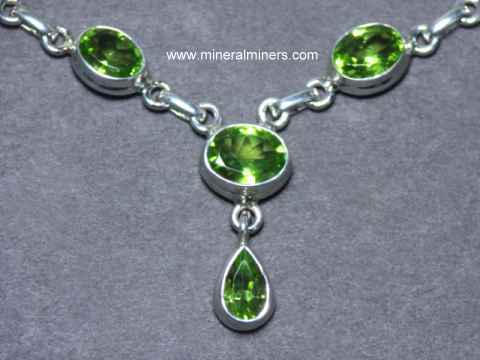 Would you like us to inform you when we add more natural color green peridot crystals on this page? We have over 150 tons of gem & mineral items in stock at our mineral warehouses, and we have additional peridot specimens available including loose peridot crystals and peridot crystals in matrix, so be sure to let us know if you have any peridot crystal special requests. Please contact our webmaster or our 'site' geologist with any questions or comments regarding our genuine peridot crystals.